Superbookkids.com is giving away ipods! If you want to win an ipod shuffle just visit their website for more details about the contest. 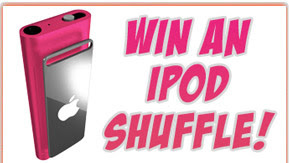 Don’t miss your chance to win an ipod shuffle, contest ends Wednesday, March 31, 2010! By the way if you’re looking for a Christian game site, Superbook.com is the right website for your kids, they offer free online games and great Christian music as well.